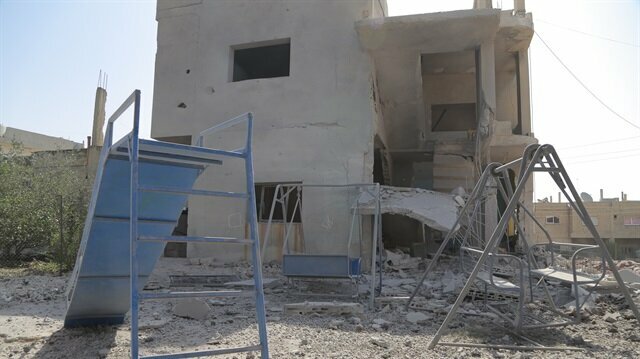 The YPG/PKK terrorist group on Friday closed three Assyrian schools in parts of northeastern Syria under its control on grounds that the targeted schools did not have a license. The Assyrian Democratic Society (ADS) slammed the move on social media, accusing the terrorist group of “intimidating” the region’s Assyrian community. “The YPG is harming education with its ideological school curriculum," the ADS said in a statement, going on to demand that the terrorist group immediately allow the schools to reopen. Regime helicopters have started dropping flyers at various points in Syria’s opposition-held Idlib to threaten civilians. The propaganda warns, “Lay down your arms and collaborate with Assad!”The Assad regime and its Iran-backed Shia militia’ allies have already started to harass southern Idlib and speeded up its military deployments, dispatching dozens of troops, tanks, armored vehicles, missile-launching platforms and Iran-backed Shia militias along the Turkmen Mountain.The regime has also used its propaganda leaflets in the areas of Dera, Homs and Ghouta which it has captured in the past few months.On the other hand, last week, two Chinese diplomats raised the possibility of Chinese military operations in Syria’s Idlib alongside the Assad regime.Idlib, located in northwestern Syria on the Turkish border, has faced intense attacks by the Bashar al-Assad regime after a vicious civil war broke out in 2011. Since March 2015, Idlib is no longer under the control of the Assad regime and has been overrun by opposition groups.Turkey has stated that any attack on Idlib would result in the country withdrawing from the Astana talks and lead to a great disaster. The Astana peace talks were launched on Jan. 23-24, 2017, with the aim of putting an end to violence and improving the humanitarian situation in war-torn Syria. In recent years, the YPG, the PKK terrorist group’s Syrian branch, has used schools in areas under its control to indoctrinate students with its militarist, ethno-centric ideologies. During the upcoming academic year, the YPG/PKK reportedly hopes to expand the use of its curriculum to high school students.